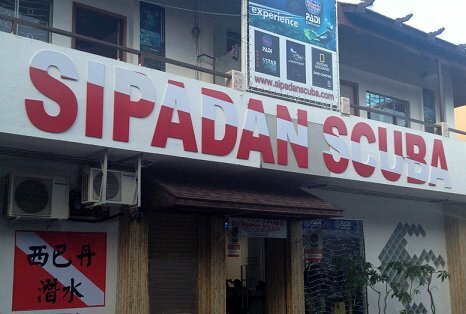 Sipadan Scuba (North Borneo) is a PADI 5* IDC dive center located in Semporna town. Sipadan Scuba offers daily trips to Sipadan island. Sipadan Scuba offers accommodation at the Holiday Dive Inn. As the pioneers of scuba diving from the mainland town of Semporna we conduct daily dive trips to Sipadan and other islands. For more experienced divers we also conduct dive safaris with overnight stays at various island resorts in the area that offer even better opportunities to get close up with the many highlight of underwater Borneo. May it be sharks and turtles, which are guaranteed at some dive sites, or mantas and eagle rays, with well over 10 years of experience diving the waters off Borneo we know exactly where to look. Our fleet of custom built dive boats are capable of getting us to the best dive sites in the shortest possible time without compromising comfort nor safety. As a fully certified PADI dive centre we also offer the full range of diving courses from beginner level to assistant instructor level with courses starting on a daily basis, conducted by our professional, multilingual PADI instructors with actual course dives being conducted at such exiting islands like Sipadan, Mabul, Kapalai or Mataking. The Semporna Marine Park, actually a chain of islands separating the Sulu Sea to the north from the Celebes Sea to the south, mapoccupies a huge area. A great way to dive the best dive sites within that area is by taking a dive safari. Our dive safaris, which take between 2 days to 1 week, are designed in a way to include a number of dives at Sipadan Island while the rest of the dives will be conducted at the best dive sites of other islands within the area, most notably at Mabul, Kapalai, Roach Reef, Yoshie Reef, Boheyan, Mataking and Mantabuan. Drawing from 10 years of diving experience in the area and using two of the biggest and fastest custom built dive boats in Borneo that can both be equipped with GPS and depth sounder as required, we are able to get our divers to the best dive spots quickly and comfortably. The diverse dive sites offer drop offs, slopes and plateaus in depths ranging from 2m to 60m, visibility between 10m to 40m and currents that may be swift. Sightings of sharks and turtles are guaranteed at some sites and large mantas or eagle rays often pass by in the blue while schooling barracudas and jacks sometimes form tornados darkening out the tropical sun. There are also two ship wrecks nearby that offer some additional excitement for interested divers. Included in our dive safaris are boat transfers and diving as stated in the respective itinerary; tanks, weights, weight-belt and guide; all meals and soft drinks except mineral water in bottles, alcohol & carbonated drinks; and accommodation on twin/triple share basis with attached bathroom/toilet facilities. Night dives are for certified advanced divers only but during safaris we offer upgrades for open water divers to PADI Adventure Diver or PADI Advanced Open Water Diver. Not only our students but all divers are welcome to join our Dive Club. Dive Club members are eligible to a discount on equipment purchases. We are an authorized dealer for Apollo, Beuchat, Camaro, Seasuits, Suunto, and Seacsub diving equipment. Have a look at our selection of top quality dive suits. All members will receive our monthly newsletter with information about all the dive trips we plan for our members. If you are interested in one of these trips just give us a call, we will put you in a group and arrange everything for you from transport to equipment, accommodation, etc. Specialty Diver Courses are also the stepping stone to PADI's highest rankings in recreational diving: The PADI Master Scuba Diver rating denotes superior achievement and proficiency in dive skills, experience and underwater activities. To put yourself on top and reach the PADI Master Scuba Diver level, you need to complete the PADI Open Water Diver, PADI Advanced Open Water Diver, PADI Rescue Diver, and any five PADI Specialty Diver certifications. Approximately 15min be speed boat from Sipadan lies the exhilarating Kapalai Dive Resort, sitting on its sturdy stilts on the shallow sandbanks of the Ligitan Reef. Planned and built in full style as an airy, comfortable, sunny water village with no land in sight, it boasts a mile-long sandbank of powdery blindingly white sand where one can suntan at complete leisure. The resort offers great food, surprisingly roomy and elegant twin-sharing wooden chalets with huge private balconies and attached bathrooms and a couple of miles of walkways for those who like to take their morning jog while looking at thousands of fish just a few inches beneath their feet. Meals are served in the terraced, open central structure, while a big western sundeck allows divers to have an evening drink or an after-dive chat with a background of fabulous tropical sunsets.Diving around Kapalai is exceedingly easy and shallow but quiet spectacular: the sandy bottom and the spare coral heads host an amazing array of small, often yet-to-be-classified, shamelessly colorful subjects, making the diving here an unforgettable experience for any discerning photographer. The resort offers three boat dives a day at Kapalai, Sipadan or Mabul and unlimited shore dives off the jetty. Originally designed to be a second base of operations to complement the existing resort in Sipadan, with the new conservation project in progress, Mabul island has become a flagship operation and base for diving both Sipadan and Mabul. Accommodation is provided in comfortable chalets, all with a view of the beach and the Borneo Mainland in the distance. Each chalet is fully air conditioned and the ensuite bathrooms provide modern hot showers and toilet facilities. While staying at Mabul you'll be able to dive at Sipadan, Mabul and nearby Kapalai. Rare creatures such as Blue Ring Octopus, Flambouyant Cuttlefish and Mandarin Fish can be found in Mabul, also present are several species of Sea Horses and Pipefish. Yet, just ~20min away is the famous Sipadan Island where all the big fish action will provide an adrinalin rush even the most seasoned diver. The resort offers three boat dives a day at Mabul, Sipadan and Kapalai. The private island of Mataking features a beautiful private resort. A must dive destination to combine with Sipadan between March and August only is Layang Layang. Its reefs offer great visibility and are in particular famous for schooling hammerhead sharks during the season from March until July. Amongst others mantas, leopard sharks, giant sting rays, schooling tunas in the depth and rare fishes like ghostpipe fish, frog fish, etc. inside the lagoon can be seen regularly. The dive centre offers 3 daily boat dives and one night dive if the conditions allow it. PADI dive courses can be arranged on request. Although very far from civilization it offers 4* accommodation and services. All rooms have air conditioning, room bar, queen size beds, telecom facilities, TV/ video & radio and a sun deck. The restaurant serves a delicious variety of local, Chinese and western cuisine. Layang Layang has its own airstrip and can only be reached by plane from Kota Kinabalu. Due to its exposed location in the middle of the South China Sea, Layang Layang Resort is closed during the monsson season from November to February. As there is not a daily flight service between Kota Kinabalu and the island advanced booking is required!